Tickets for demonstrations by John and other well-known MasterChef faces such as reality TV star Spencer Matthews and Scotland’s National Chef Gary Maclean are expected to be snapped up when they go on sale at 10am today. The countdown is on for a chance to see celebrity chefs including John Torode in action at this year’s Taste Of Grampian – and fans are being urged to get in fast. Sir Elton John is bringing his last-ever live tour to Aberdeen – and the global superstar is the first major music act to be announced to play the north-east’s glittering new TECA. Tickets for Take That's massive arena tour to celebrate their anniversary and the release of their Greatest Hits album are on sale now. 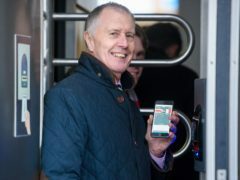 First are also launching a new unlimited monthly pass paid for by direct debit. Dons boss Derek McInnes hailed new signing Lewis Ferguson after he netted the winner in their pre-season friendly against Falkirk. Fans were turned away from Noel Gallagher’s north-east show after purchasing secondhand tickets for the gig. Runrig have announced that a limited number of extra tickets will be made available for their farewell gig. First Bus drivers have hit out at the “extortionate” prices being paid by customers in Aberdeen. Comedian Kevin Bridges has added two more Aberdeen dates to his tour after tickets sold out this morning. Aberdeen's animal lovers are in for a treat as The Supervet will bring his first live stage show to the North-east - and tickets are onsale now. Whether you love live music or seeing your favourite comedian in person, Aberdeen's got you covered in 2018. Little Mix announced today they will be returning to Aberdeen for a special outdoor gig. Tickets for Kevin Bridges' new tour have gone on sale today. Tickets for Gary Barlow are on sale now – here’s where to get them before they sell out! Tickets for Gary Barlow's Aberdeen gig have gone on sale today. Tickets for Disney on Ice have gone on sale today.